After over 5 years of meal planning, I am definitely a big fan. 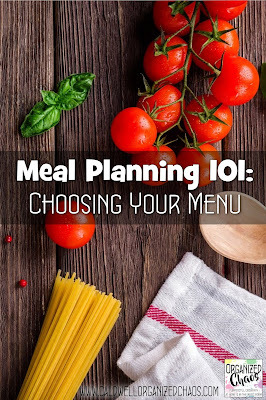 After numerous conversations with people who say they want to try meal planning but just "can't get organized enough", I thought I would share my tips for people who want to give meal planning a shot but don't know how to get started. Today we're talking about how to pick out your meals for the week so that you're more likely to actually follow through with your plan! One of the most common excuses I hear for why people don't meal plan is that they just can't anticipate more than a day or two ahead what they will want to cook. The key to avoiding this pitfall is making sure you're considering the rest of your schedule when you're making your meal plan! The key is to plan your meals LAST! 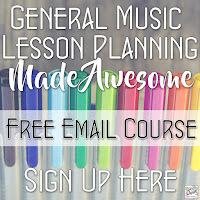 There is no way to be a meal planner without being a planner in general, at least to a certain extent. You need to know which days you're going to be rushing around in the evening, when you might have company coming over, etc in order to make a meal plan that you can actually follow. When I sit down to plan out the week ahead each weekend, I always plan out everything else first- my children's activities, my work schedule, appointments, etc- then figure out my meals based on those factors. The other important factor for creating a workable meal plan is to have plenty of realistic recipes at your fingertips. If you love spending time in the kitchen and have the time and desire to do so, save those recipes you get excited about making. If your evening schedule makes it impossible for you to spend more than 15 minutes in the kitchen, make a list of recipes that are super-quick to make. You're more likely to be successful in meal planning if you don't have to reinvent the wheel every time you sit down to plan out your menu! Set up (and maintain) a solid list of recipes that fit your lifestyle! For me, Pinterest has been my best friend for keeping track of recipes I love. If you're like me and don't have much time to spend in the kitchen but still like to have variety and healthy meals, you're welcome to check out my boards for crockpot dinners and easy dinner recipes! There's also nothing wrong with going with good old index cards in a recipe box. Start a list somewhere that you can easily access, and add to it whenever you come across new recipes. 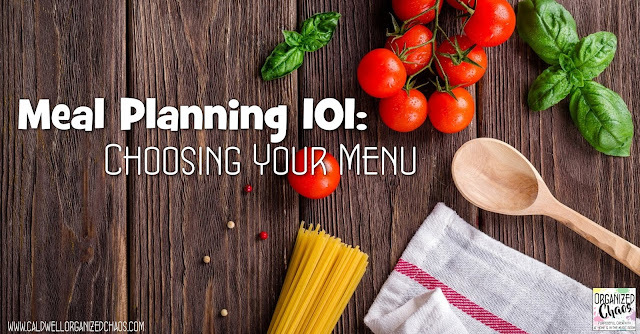 Once you've got a solid list of meals started and you get in the habit of planning out the rest of your week before choosing your menu, you're well on your way to successful meal planning! 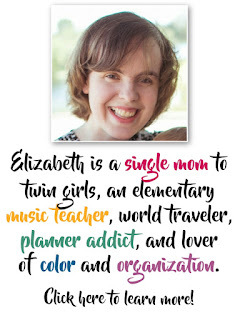 I'll be back to talk about more meal planning tips in future posts, so stay tuned- summer is a great time to pick up meal planning if you're hoping to get in the habit for the new school year! Stay in touch and get timely ideas and resources sent to your inbox by signing up here for the Organized Chaos Newsletter! I don't know how people function without meal planning. I sit down every Saturday morning (or Friday night, if I'm super motivated)and look at my schedule for the week and then plan the meals before making a grocery list. I find that if I don't do this, then I'm coming home from school at 4:30 or 5 and don't know what to do about dinner and all the meat is in the freezer and small children are grumpy and hungry...it's all bad.